Gaithersburg is a city in Montgomery County, Maryland, just northwest of Washington, D.C.
Review the latest and most accurate housing data for Gaithersburg, MD. 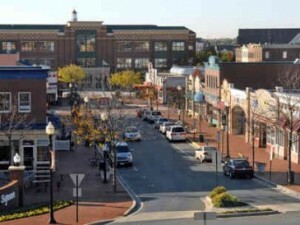 Gaithersburg is divided into east and west sections, separated by Interstate 270. The eastern section of the city is older and is the original portion of the town before more recent growth. Landmarks and buildings from that time can still be seen in many places but especially in the historic central business district of Gaithersburg called “Olde Town“. The east side also includes Lake Forest Mall, City Hall, and the Montgomery County Fair grounds. The west side of the city has many wealthier neighborhoods that were designed with smart growth techniques and embrace New Urbanism. These include the award-winning Kentlands community, the Lakelands community, and the Washingtonian Center (better known as The Rio), a popular shopping/business district. The city had a population of 59,933 at the 2010 census, making it the fourth largest incorporated city in the state, behind Baltimore, Frederick, and Rockville. The National Institute of Standards and Technology (NIST) is headquartered in Gaithersburg directly west of I-270. Other major employers in the city include IBM, Lockheed Martin Information Systems and Global Services. Area headquarters include MedImmune (recently purchased by AstraZeneca), and Sodexo. The city is also the location of the 220th Military Police Brigade of the United States Army Reserve.